​Pleasant laughter came out of the tent just outside of the Great Dharma Hall temporarily installed for the upcoming Buddha’s Birthday at Hwagyesa Temple. It was the students of “Hwagyesa Temple Buddhist Painting Class” who were painting lanterns ten times as large as the students themselves in preparation for the Lotus Lantern Festival. Though the class does not hold sessions on Fridays, the students gathered every Friday with brush and ink in their hands since the beginning of February. As Ms. Seo mentioned, seven students have voluntarily come for the preparation work on that day. Hwagyesa will present laterns in the shapes of “Dragon Boat of Wisdom” “Gilt-Brozne Maitreya in Meditation” and “Great Seon Master Seungsahn”. The frames are built at a factory according to blueprints. Then the men’s group at the temple, glues pieces of paper on to the frame to make the lantern. Finally, the Buddhist painting class colors the lanterns. The whole process takes about three months from February to Buddha’s Birthday. In order to paint not only the lanterns for the Lotus Lantern Festival but also thirty or more lanterns to decorate the temple ground, it takes more than three-hundred hours in total, five to six hours per hour. This is also a once-a-year opportunity for the students of Buddhist painting class to show their talents, so the every stroke of brush is taken with care. In order to add gradation to the colors, the students use a traditional panting technique called “Ba-rim” searching on the smart phone to find the exactly fitting colors. The Students also do not forget to leave certain spots uncolored so that the light can properly penetrate through the paper. 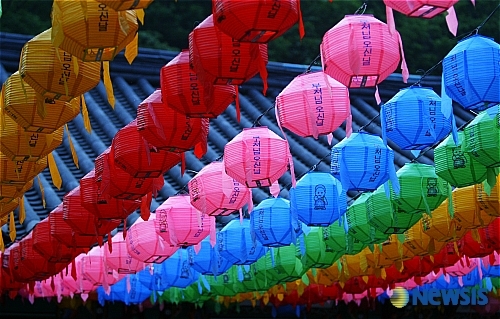 The lanterns built by the men’s group and painted by the Buddhist painting class will be displayed to the public at the center of Jongro District as well as at the temple ground.